Peter "P.C." Hiebert: Mennonite Brethren educator, minister, and relief agency leader; born 5 April 1878 in Hillsboro, Kansas, the fifth of seven children of Cornelius and Katherine (Wiens) Hiebert (see additional information for further details regarding the family of P. C. Hiebert). He married Katherine Nikkel in 1907. P.C. Hiebert died 27 May 1963 in Hillsboro, Kansas, where he was buried. Peter's parents came to Kansas in 1876 from South Russia. Cornelius served as farmer-minister in the Ebenfeld Mennonite Brethren congregation, the first organized Mennonite Brethren congregation in North America (1876). After completing country school, Peter attended Hillsboro High School. He studied at McPherson College (BSD, 1903; AB, 1906), the Baptist seminary in Rochester, New York, Winona Lake School of Theology, and the University of Kansas (MA, 1912). He later studied at John Fletcher College, University Park, Iowa (DD, 1929) and attended Harvard University in the summers of 1929 and 1930. Hiebert taught in rural schools in Kansas for five years and was pastor of Mennonite Brethren congregations in Dallas and Portland, Oregon in 1907 and 1908. Together with H. W. Lohrenz, Peter helped establish Tabor College in Hillsboro, Kansas, 1908. 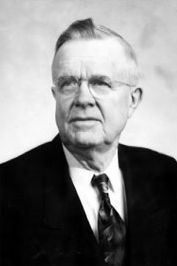 Here he served as teacher, dean, vice president, and president (1932-1934) for 25 years (he taught at Sterling College in 1931-1932). Then he taught at Sterling College for 13 additional years. He was a strong advocate for Christian liberal arts education. Ordained as minister by the Ebenfeld Church, he served his conference as secretary or chairman of the Board of Home Missions for 18 years; moderator of Pacific District, Southern District, and the Mennonite Brethren general conference; chairman of the Relief Committee (MB) for 40 years; chairman of the committee which compiled the 1953 hymnal; and as traveling minister for over 60 years in United States, Canada, Europe, Russia, and South America. He represented the North American Mennonite Brethren conference at the Mennonite World Conference three times. P. C. Hiebert helped organize the Mennonite Central Committee (MCC) and served as its chairman for the first 33 years. He first met Orie Miller at an organizational meeting in the Prairie Street Mennonite Church, Elkhart, Indiana in 1920. Here a friendship and partnership developed that enriched the lives of thousands with whom they worked through the MCC around the world. P. C's work with the MCC began with a trip to South Russia in 1922 to aid Mennonites in the colonies suffering from famine, drought, and revolution. Between the wars Hiebert worked hard to keep the MCC alive through projects related to colonization, refugees, and relief. He was the first chairman of the MCC Peace Committee (Peace Section) and helped develop, in collaboration with the Church of the Brethren and Friends, "A Plan for Action for the Mennonites in Case of War." He helped organize the National Service Board for Religious Objectors (NSBRO), an agency through which the historic peace churches could together deal with Selective Service (US). This, in turn, led to the establishment of the Civilian Public Service Camps. Hiebert's leadership touched the lives of people around the world through service "in the name of Christ." His life was deeply colored by the Anabaptist vision of Christian discipleship. His witness was focused by two crosses—the cross of Christ's atonement and the disciple's cross. These two crosses gave unity and purpose to his life. GRANDMA (The Genealogical Registry and Database of Mennonite Ancestry) Database, 6.02 ed. Fresno, CA: California Mennonite Historical Society, 2010: #3420. Hiebert, P. C. and Orie O. Miller. Feeding the Hungry. Scottdale, PA: Mennonite Central Committee, 1927. Hiebert, P. C. and Orie O. Miller. Mitteilungen von der Reise nach Süd-Amerika. Hillsboro, KS: MB Publishing House, 1937. Mennonite Life 14 (July 1959): 105-9. Springer, Nelson and Klassen, A. J., compilers, Mennonite Bibliography, 1631-1961, 2 vols. Scottdale, PA: Herald Press, 1977: II, 455. Warkentin, A. and Melvin Gingerich, compilers. Who's Who Among the Mennonites. North Newton, KS: Bethel College, 1943: 110. Peter was the son of Cornelius Hiebert (6 December 1835, Einlage, Chortitza Mennonite Settlement, South Russia - 11 August 1904, Hillsboro, Kansas, USA) and Katherina Wiens (25 April 1841, Rosenthal, Chortitza Mennonite Settlement, South Russia - 4 August 1887, Hillsboro, Kansas, USA). He was the fifth of seven children (five others died in infancy). After his mother's death, Peter's father was married for the second time in 1888 to Elizabeth (Harder) Poetker (16 October 1848 - 4 July 1891, Kansas, USA), a widow with five children. Cornelius and his second wife Elizabeth had three children. Peter's father was married for the third time in 1893 to Katharina (Gossen) Warkentin, a widow with five children. Peter was married on 1 January 1907 in Hillsboro, Kansas, USA to Katharine L. Nikkel (19 October 1885, Yates Center, Kansas, USA - 27 October 1981, Hillsboro, Kansas, USA), daughter of Cornelius Nikkel (22 February 1848, Nieder-Chortitza, Chortitza, South Russia - 27 May 1902, Ebenfeld, Marion County, Kansas) and Katharina (Leppke) Nikkel (29 October 1853, Nieder-Chortitza, Chortitza, South Russia - 7 June 1922). Peter and Katharine had six children: Viola, Rose, Victor (died in childhood), Evaline, Noble, and Martha (died at birth). Wiebe, Katie Funk and Richard D. Thiessen. "Hiebert, Peter C. (1878-1963)." Global Anabaptist Mennonite Encyclopedia Online. June 2010. Web. 22 Apr 2019. http://gameo.org/index.php?title=Hiebert,_Peter_C._(1878-1963)&oldid=92016. Wiebe, Katie Funk and Richard D. Thiessen. (June 2010). Hiebert, Peter C. (1878-1963). Global Anabaptist Mennonite Encyclopedia Online. Retrieved 22 April 2019, from http://gameo.org/index.php?title=Hiebert,_Peter_C._(1878-1963)&oldid=92016. Adapted by permission of Herald Press, Harrisonburg, Virginia, from Mennonite Encyclopedia, Vol. 5, pp. 370-371. All rights reserved.